Going to the beach is a basic part of any vacation or life on the Oregon Coast. Although it’s fun to visit coastal towns and drive along Highway 101, you’ll want to spend time plenty of time at the beach, too. They’re beautiful and relaxing, but also perfect for energetic outdoor sports. There’s so much to do at Oregon beaches that you could visit one every day and never get bored. For starters, here’s a list of popular beach activities that are popular among locals. Participating in these activities can be a great way to meet people and make connections on the coast! You might not imagine the Oregon Coast as a prime place for surfing, but it is! You just need a wetsuit to enjoy some of the best waves in the world. Read about great places to the go surfing on the coast, and get ready for an awesome day out on a surf. Beachcombers visit the Oregon Coast mainly to look for agates, a unique kind of stone. The stretch of beach between Newport and Otter Rock is especially renowned among agate hunters, including the well-named Agate Beach. You can find sizable agates here and elsewhere along the coast, from little one-inch pieces to impressive stones that weigh several pounds! Besides agates, you can find lovely driftwood and fossils like petrified wood along the coast. Also, if you visit Lincoln City’s seven-mile beach from mid-October to Memorial Day, you can search for handcrafted glass floats that have been placed on the beach. During this treasure hunt, called Finders Keepers, more than 3,000 floats are put out for you to find and keep! The Oregon Coast has many rocky beaches that are ideal for tidepooling. 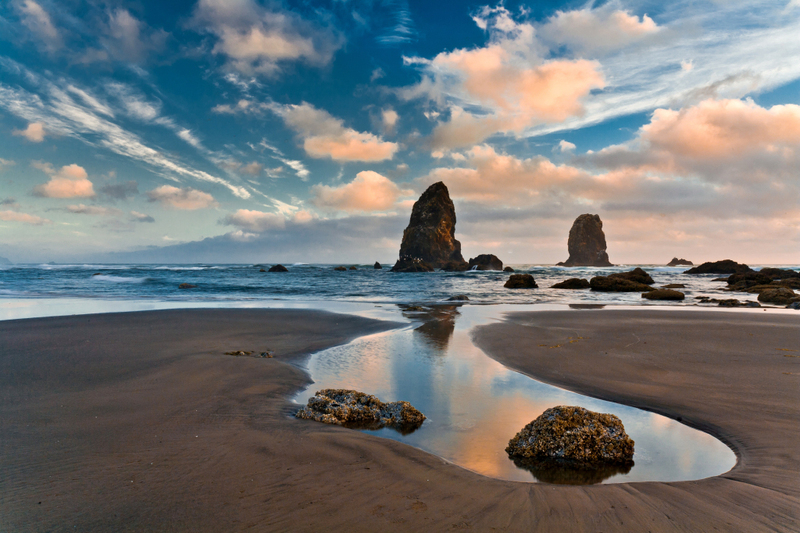 Popular spots for finding tidepools include Haystack Rock, Yaquina Head, and Arcadia Beach. You can also go on a tidepool walk with a park ranger at a State Park to learn more about the animal species living in the pools. Although Depoe Bay is the whale watching capital of the Oregon Coast, you can spot whales all along the coast. In winter, you can watch almost 20,000 gray whales pass by the coast as they migrate from Alaska to Baja, Mexico. Then, in the spring, they return to Alaska or take up residence by Depoe Bay for the summer. In addition to gray whales, you can catch sight of orcas, humpback whales, and blue whales while sitting on the beach. For the best chance of seeing whales, visit one of the top places for whale watching or volunteer during the whale watching weeks in December and March. Every year in August, fans of beach volleyball flock to Seaside, Oregon for the world’s largest amateur beach volleyball tournament. Thousands watch and participate in the huge event, which includes around 140 courts and over 1,400 teams from across the US and Canada. You can enjoy watching the teams play or even register for the event yourself and practice on the Oregon Coast’s sandy beaches. Sandcastle contests are an annual event in several Oregon Coast towns, including Cannon Beach and Lincoln City. Whether you put your skills to the test in these competitions, or just enjoy a relaxing day of crafting sandcastles, it’s a fun way to express your creativity while spending time at the beach. The Oregon Coast has a lot of kite enthusiasts. If you love watching and flying gorgeous kites, be sure to visit one of the annual kite festivals in Brookings, Rockaway Beach, and Lincoln City. You’ll see incredible kite demonstrations, taste delicious local food, and possibly walk away with a beautiful kite and new hobby. Check out our listings to find beautiful coastal homes with beach access, and prepare to fall in love with coastal living.